Rhodochrosite is a beautifully vibrant pink coloured gem that appears to be illuminated from within – this unusual brilliance makes it a favourite amongst jewellery enthusiasts and designers. The name rhodochrosite comes from the Greek word meaning ‘rose coloured.’ In ancient times, the Incas believed these lustrous gemstones were the blood of their former rulers turned to stone, therefore they are also sometimes called "Rosa del Inca" or "Inca Rose". Scientifically classed as a manganese carbonate mineral, rhodochrosite is further categorised as a rhombohedral crystal, defined by forming as a latticed prism with six, four sided facets, or a trigonal pattern. 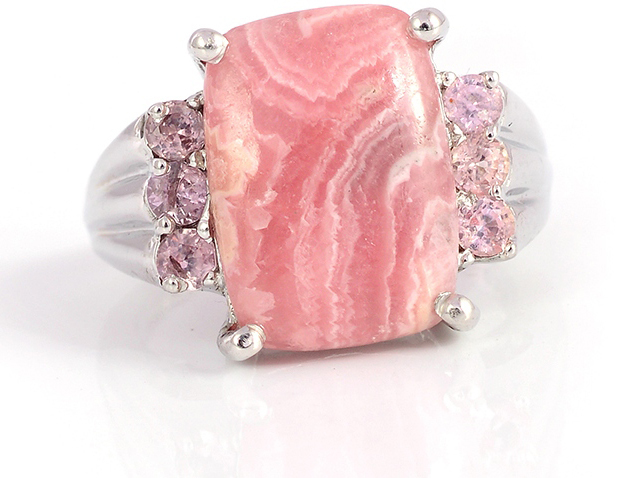 Rhodochrosite has an unforgettably brilliant variegated colour, which can range from white to soft pink to red. It is further distinguished by displaying beautiful alternating bands of concentric patterns which feature various hues of intense pink. This vibrant pink to red colour is caused by traces of manganese in the crystal during formation, while if other colours are present such as yellow or brown, the crystal is considered ‘contaminated’. This strikingly attractive gemstone, with its soft pink to red vibrancy and alluring bands of shading, makes for an outstandingly distinctive jewellery centre piece. While the transparent, faceted varieties are rare and therefore pricier, overall rhodochrosite is surprisingly affordable given its unusual splendor. For those who believe in the healing properties of gems, rhodochrosite is particularly prized, particularly with regard to blood ailments. Most rhodochrosite on the market is pink in colour, and includes natural inclusions (inherent flaws that are common to many gems). Specimens that tend toward a more vibrant reddish hue with no inclusions that are visible to the naked eye are extremely rare, therefore more expensive and valuable. Transparent, faceted rhodochrosite gemstones are also in high demand because they are also rather rare.